Established in 1959, Miguels is a local landmark. 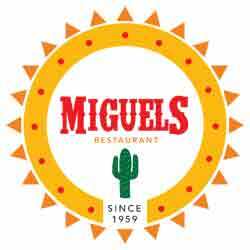 Known for our fresh, authentic Mexican dishes, Miguel’s has won several awards that distinguishs it from the rest. They pride themselves in using the freshest ingredients and original recipes in the preparation of all our meals. Miguel’s is family owned and operated. Miguel’s exceeds the standard in cleanliness, service & tastiness!